Come check us out at the new Shake Shack at the Country Club Plaza! Ashleigh’s Bake Shop’s pie is now being featured in the Pie Oh My! concretes at the Shack Shack on the Plaza. Our pie is lightly mixed into their delicious frozen vanilla custard. Try the Pie Oh My featuring our cherry pie through September and our bourbon pecan served October - December! 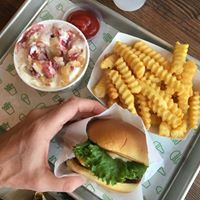 Even sweeter, Shake Shack is donating 5% of the sales from the Pie Oh My concretes to the local Young Friends of Art.